1. The Best way to protect and absorb impact. 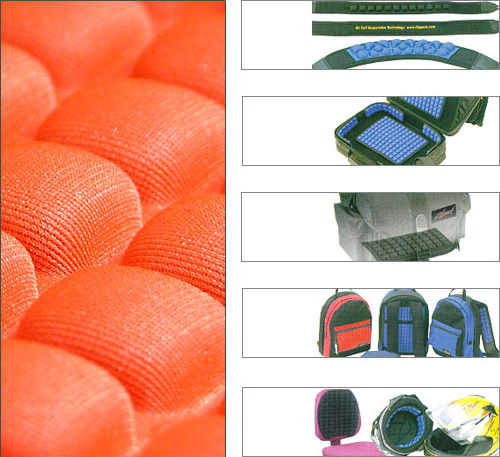 AirCell is applicable to so many different fields as shock Absorbing materials. AirCell uspension Padded Bags of Laptop Computers & Cameras are very strong protection and safety protect for your very valuable equipments from shocks or impacts. 2. Designed to considering your shoulder. The core technology of AirCell Strap System giving an extremely comfort from dispersion of weight and dull interrupt a bloosd circulation. So, much less pain, feels lighter weight than real. Minimized fatigue & Maximum comfort. Confirmed that the AirCell is very strong under 2-3Ton loading and no deformation from high & lower temperature. 4. Multi-purpose for your needs. AirCell Suspension Panels are applicable not only Laptop/Camera bags but also any Musical instruments cases bags & Sports, Clothing & etc with Comfort Strap System.